Growing up in Brooklyn, every pizzeria had the two basics, pizza and calzones. Maybe a few zeppole off to the side. But that was just about it. Today you walk into a pizzeria and it’s hard to find a plain slice among all the “gourmet” varieties. Calzones were about as simple a meal as a slice of pizza, and very satisfying. Back in the day, a calzone was simply pizza dough stuffed with ricotta, mozzarela and ham. I don’t remember any other calzone being available. Or maybe that’s all my mother ever ordered when we had take out from the pizzeria. No one even delivered. The pizza boxes were not the heavy boxes you could stand on today. They were also a lot easier to get rid of after the pizza was eaten. Today’s pizza boxes protect the pies a lot better but you need a hydraulic press to break them down and place them in the garbage. You would think they were being shipped across the country and protecting fine china. A calzone is like a turnover. Translated from Italian it means stocking or trouser. A neat little pocket filled with something good. 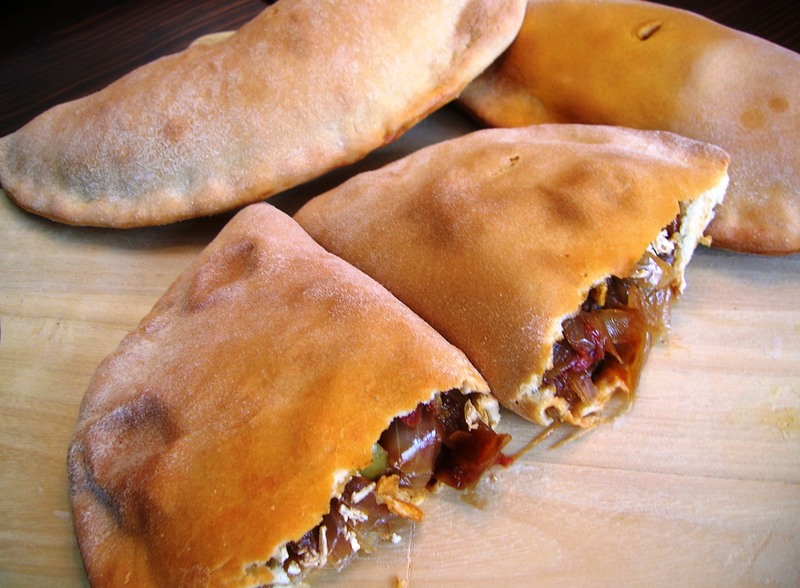 Calzone Barese is a baked turnover originating from the town of Bari in southern Italy. Bari is on the Adriatic Sea above the heel on the boot of Italy. 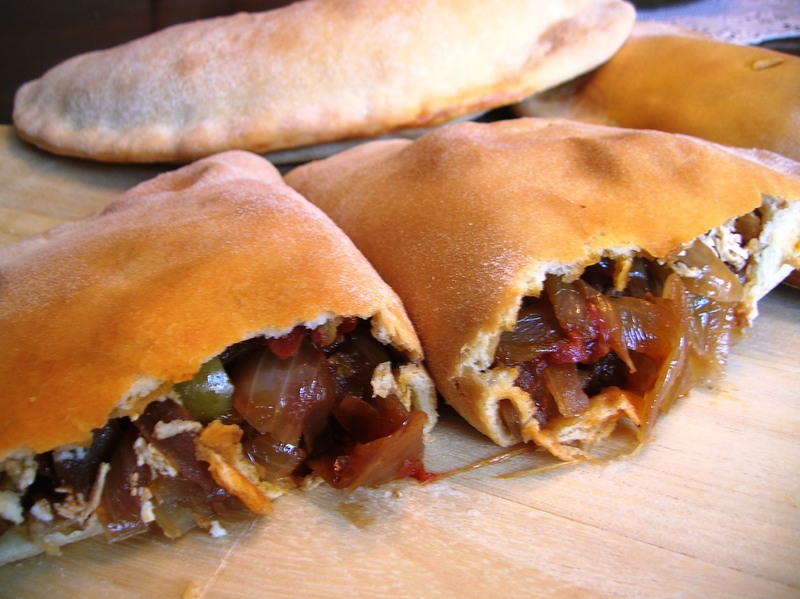 If you like fried onions you will love this calzone! The combination of the sweet from the onions and raisins and the salty from the olives and ricotta salata make this a wonderful savory calzone treat. A nice change from the usual ricotta filled calzone. 3 large Spanish onions, sliced 1/4 inch thin. 3/4 cup olives Baresane, pitted and roughly chopped (Baresane olives are a small green olive. If you can’t find these you can use kalamata olives) An easy way to pit the olives are to smash them with the side of your knife like you would smash a clove of garlic. Put the yeast, sugar, and water into a small bowl. Stir and let rest for 5 minutes. Mix flour and salt in a large bowl . Add the olive oil to the yeast mixture and pour into the bowl with flour. Stir and work into a dough. On a lightly floured surface, knead the dough for at least 8 minutes, or until smooth and silky. Add some extra flour if dough is too sticky. Shape the dough into a ball. Lightly oil a bowl. Place dough in oiled bowl to coat one side then flip dough over to coat the other side. Cover with a dish towel and put in a warm place for 1 hour, or until doubled in size. In a large frying pan heat 1/4 cup olive oil on medium heat. Cook the anchovies, breaking them apart with your spoon, till they dissolve into the oil. Add the sliced onion and stir well. Let the onion cook, without stirring too often, to caramelize on medium high heat. When the onions are nicely browned add the chopped tomatoes. Cook the tomatoes down for about 5 minutes on medium heat. Take the pan off the heat and add the olives and raisins, stirring well. Let the mixture cool. If you have a pizza stone, place it in the oven and preheat to 400 degrees for at least 15 minutes. If you don’t have a pizza stone, lightly oil a baking sheet and cook the calzone on the baking sheet. Once the dough has risen to double in size cut in half and then half again, so you have four pieces. Roll each piece into a ball and set aside, covered with a cloth. On a lightly floured surface roll out the ball of dough into a circle about 10-12 inches. Spoon 1/4 of the onion mixture onto the dough. Add about 1/4 cup grated Ricotta Salata cheese on top. Turn over one half of the dough over the other and seal the edges by pressing down with your fingers. Cut off any excess dough around the edge, leaving about a half inch from the filling. Poke a little hole at the top to allow steam to escape. Bake at 400 degrees for about 25 minutes or until golden brown. This entry was posted in pizza and tagged calzone, calzone Barese. Bookmark the permalink.